Anna Liccione didn’t know what the Daysies Man looked like until after her friend submitted her photo to the doppelgänger contest. When she found out, she totally embraced it. When she’s not lying blissfully in fields of daisies, the recent Johnson State College graduate makes jewelry, which she sells at area markets under the name This Good Earth. 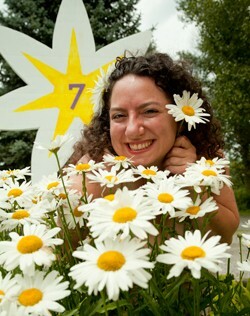 SEVEN DAYS: So how did you end up taking that great picture? ANNA LICCIONE: I was at a party. And my friend Justin Marsh and I — he runs the Cambridge Music Festival — we were taking pictures, and I was like, “Ooh, let’s do a photo shoot!” I was posing on the rocks. Posing on a boat. And then there was a field of daisies. So I waded into the daisies with my little Woodchuck [Hard Cider]. The Woodchuck just makes the photo. SD: How does it feel to be the official Daysies Man Doppelgänger? AL: I’m so excited! Oh, my gosh! I’m a ham. And I love to have fun. Kurt B is a Burlington-based glass blower who specializes in pipes — he makes one that resembles his famous mustache. 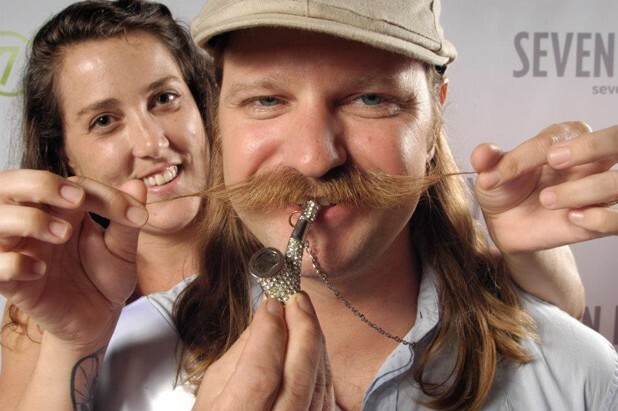 He began growing his signature ’stache eight years ago and blow dries and waxes it daily. Don’t worry, his glass-blowing activities have never set his facial hair on fire; instead, the ’stache serves as a layer of insulation — but it sometimes ends up droopy from the heat. Kurt was out of town for a trade show last week, so we caught up with his wife, Sarah Coshow, to find out how she really feels about the hair. SEVEN DAYS: So, you like the mustache? SEVEN DAYS: If you had to destroy all but two items of clothing in your closet, which would you choose to save and why? Most people who choose to get a tree tattoo go for a spring or summer tree: full foliage, bright green and representing the obvious — putting down roots or taking shelter. Or they get a small olive branch inked somewhere inconspicuous, such as the inside of an ankle. Again: green and definitely alive. Not Paige Ely. 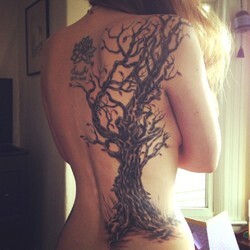 Her tree, inked by artist Keenan Bouchard at Good Ink in Waterbury, is a gnarled, autumnal specimen in dark grays and browns. It twists across the entire right side of her back, extending claw-like branches across her spine and toward her right breast. It’s eerily beautiful, but unexpected. SEVEN DAYS: Most people go for the more obvious tree metaphor, like the tree of life. Yours is … not that. Why? PAIGE ELY: Actually, it does represent a spiritual connection with nature and an enduring force, but you’re right; it looks old and there are only a few leaves left on it. I wanted to capture a sense of its having a past and coming through hardship, so it’s definitely more serious than a spring tree. I can relate to that, so it’s a good one for me. It’s also only a few weeks old! 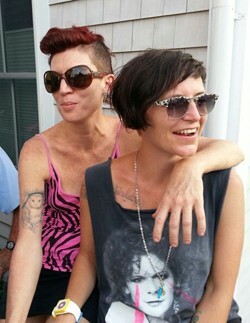 It was Jess Mateik’s last night visiting a friend in Provincetown, Mass., and she wanted to go out dancing. At the end of the night, just when she and her friend were about to go home, the DJ put on Kid Cudi’s “Day ‘n’ Night,” one of her favorite tunes. “Let’s just dance one last dance,” Mateik recalls telling her friend. “Let’s find someone to dance with.” And that’s when she found Justine Crosby. After a couple years of moving back and forth between Provincetown and Burlington to be together, the couple now lives in the Queen City. Crosby, 34, is a stylist at Burlington’s Salon Cruz, and Mateik, 36, works as a licensed nurse assistant, teaches drum lessons and plays in the band Shark Victim. SEVEN DAYS: What’s the secret to being so cute? JESS MATEIK: We take good care of each other, and we make each other smile. 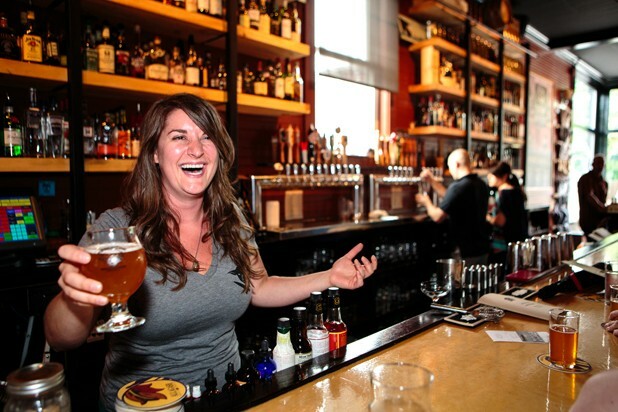 SEVEN DAYS: What was your first bartending gig? When Jim Osborn started working at Burlington’s Uncommon Grounds two years ago, his only coffee experience was as an avid drinker of the stuff. 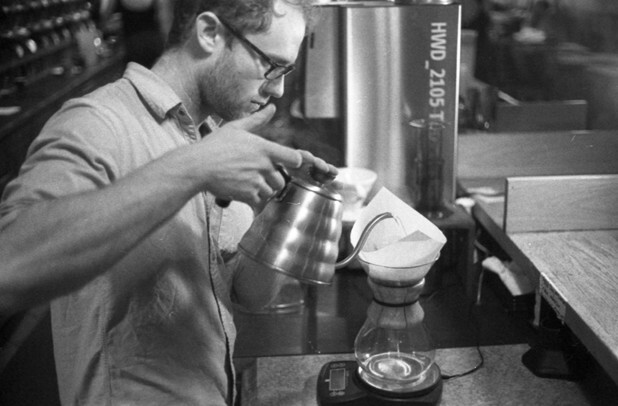 Now his coworkers say the 22-year-old University of Vermont grad is a serious dude who’s super serious about coffee. Daysie voters raved about him, saying he makes the “best macchiato in town.” When he’s not making top-notch drinks, Osborn spends his time playing electric guitar and singing in his band, How to Cook a Wolf, with two of his Uncommon coworkers. SEVEN DAYS: What is uncommon about you? JIM OSBORN: I’d like to think that there’s a bunch of things that are uncommon about me, but I’ll try to think of one. Probably how nerdy I am about coffee. I think I am neurotic about learning the most I can. When I started working here, it was a job at first, ya know? But the coffee we have is the best around, and for that reason, it’s really important to know as much as you can.